“Machiko Noguchi accepted the assignment of supervising the ranching colony on Ryushi as a challenge. Little did she know that not onl would she have run the colony, she’d have to defend it with her life! I think it would be fair to say that the Aliens vs. Predator franchise is one of the more successful and credible cross-over series (Marvel and D.C universe’s notwithstanding) and that had to start somewhere. Without Randy Stradley and Dark Horse’s first comic series, we wouldn’t be here with numerous games, comics, books and movies. And without Steve and Stephani Perry’s adaptation of that landmark series, the Predator fandom would be without a substantially important contribution to the mythos of the Predator – the yautja culture. I remember when I first found out about Prey and its creation of the yautja. I had to hunt it down. Being as I was only around 12 or so at the time, my access to internet shopping was very limited (who knew you needed a bank account??) but I eventually persuaded my Dad to purchase it (and Aliens: Apocalypse, Destroy Angels). I devoured the book in a day, reading it under the pleasant sun on some field somewhere at a random amateur radio rally my Dad had dragged me to. I’ve read it a few other times in the decade and a bit since – killing the time whilst I waited for my energy to recharge whilst playing AvP Classic – but I must admit it has been a while. In the intervening years my opinion of the yautja culture as the Perry’s introduced it has changed. I’m not a big fan of the whole samurai-in-space feel of it and coming back to the novel after all this time, I had to wonder how much I’d enjoy the read. And to be honest, I did get into the book. I found Prey really easy to read and I flew through it. I think the difference in the authors is quite noticeable with Stephani’s sections being of better quality – better word usage and more descriptive and emotive. Steve Perry’s sections just come across feeling rather “phoned in” but Stephani Perry seemed to put genuine effort in it. First off I do want to talk about the yautja culture as that is the biggest draw of the novel. Some sections of the comic are showing the happenings aboard a Predator ship and I always found their motivation in the comic to be a bit ambiguous…an obvious issue for any novelisation of the series. And the Perry’s brought the yautja culture into existence and the impact this novel had on the Predator fandom is really large. I, however, have grown to dislike this portrayal of them and this is why I thought I would dislike Prey on the re-read. I haven’t read the book since I began to dislike the samurai-in-space approach that the Perry’s took with the Predators. That is my biggest issue with the yautja. I feel like they were over-humanized, taking this aspect of samurai-like honour that was instilled on them. In Randy Stradley’s comic there is a panel where Machiko Noguchi compares the Predator’s movement to that of a samurai, her attempt to put what she is seeing into context. I’m not sure whether Randy Stradley intended to portray them in such a manner but it would seem this is where the Perry’s took their inspiration from. I can see where that interpretation would make sense – with the first film and the Predator disarming to fight Dutch – but on the other side of that I prefer the idea that it was just for a better challenge, there being more thrill for him out of the fight. But then again, there’s the problem in that the Predators, specifically Broken Tusk/Dachande, are presented as the anti-hero so there needs to be some aspect of connectivity between him and the reader and Machiko. There were some nice moments where they were both misinterpreting each other and I liked that the Perry’s included to that to still show Broken Tusk was an alien. And he certainly did clear up any moments in the comics that were confusing such as the opening part of the series and as to why the Predators were attacking unarmed humans. However, when I got to whole sections of them talking in their own apostrophe heavy language, Dachande daydreaming about Predator females (and recognizing Machiko as a female due to her breasts) and in general using human expressions in their own internal monologues…I just don’t like this method of writing the Predators. I much prefer Jeff VanderMeer’s interpretation of them in Predator – South China Sea. Obviously this novel was written after Prey but I still feel that VanderMeer was able to present the Predator point of view without humanizing it. He felt so utterly alien and so deadly. I prefer the version of the Predators where they’re out for fun! Out to hunt and enjoy the kill, enjoy the challenge. Not this human concept of honour imposed on them. Prey did a fantastic job at fleshing out Machiko Noguchi, the main character of the novel. In the comic, in Ripley-ish development, she was presented as cold corporate woman who gradually transformed into a more determined, slightly warmer women…who then decides to join the Predators (not so Ripley-ish). The Perry’s take that path and add some more depth to her, making her transformation more believable. A significant background story is added, giving her ice-cold demeanor more weight. Her decision to join the Predators is better reasoned out and flows really well. 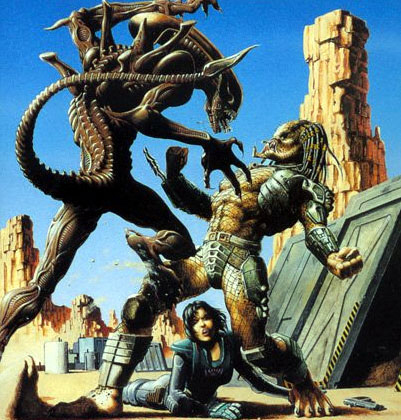 I suppose a big part of that was in the humanizing of the Predators and Machiko being better able to communicate and identify with the Predators – Dachande/Broken Tusk gives her a name and she begins to identify with that name and the yautja way of thinking at the end of the novel. One of the minor characters in the comic, Roth, is giving more significant page time and shines a lot brighter in the novel. The Perry’s make her part of a lesbian relationship – which I think works well with Ridley Scott’s vision of a socially free future. I was worried too much would be put on this development (the Perry’s tend to focus quite strongly on the sexual) but thankfully it’s handled very tastefully and not gratuitous and adds a further dimension to her character. One thing that really irritates me and I know will irritate many other Alien fans is how Steve Perry treats the Aliens. He continually refers to them as unintelligent and being no smarter than dogs and has them easily dispatched – nothing more than a nuisance. It’s not a problem unique to this particular book but something Steve Perry also emphasized in his Aliens novelizations and something the Expanded Universe does quite frequently. I miss the problem solving, trap laying Aliens as presented in the films. All that said, I do think it was a brilliant adaptation of Randy Stradley’s comic series that is in keeping with the original and it expands on key areas. I’m sure Predator fans will continue to love this novel but the yautja just aren’t for me and the Perry’s interpretation of the Aliens just will not resonate positively with the majority of Alien fans. From Corporal Hicks from AvPGalaxy.net I award Steve and Stephani Perry’s Aliens vs. Predator – Prey a 3 out of 5.